Recommended ship class: T2/ T3 Cruiser and higher or a fast Frigate to blitz. The locked acceleration gate (mission objective) is 72km away from the warp-in point. The Mining Corporation Headquarters station is about 10km away. The 1st ambush spawn is triggered when the Mining Corporation Headquarters station is attacked OR when your ship is within 10km from locked acceleration gate. 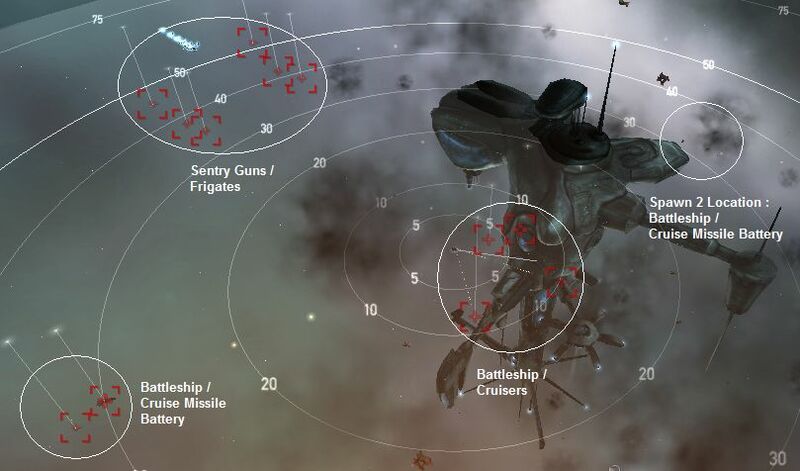 The 2nd ambush spawn is triggered when your ship is within 10km from locked acceleration gate. To manage aggro, trigger the first ambush by attacking the Mining Corporation Headquarters station. The mission is flagged completed once you have triggered both spawns, by either approaching to within 10km of the acceleration gate or destroying the station. Fly to the gate in a small fast ship or micro jump a Battleship or Battlecruiser to trigger the ambush, align and warp out as soon as the mission completes. The Mercenary Wingman frigates will spawn on top of the warp gate. You may get webbed/ scrambled if you're not fast enough in warping out. The Mining Corporation Headquarters has very high HP (~306,550) and drops mainly T1 modules and some Faction ammo. Recommended ships: Corvette, any well tanked Battleship (Raven, Dominix), Battlecruiser (Drake, Myrmidon, Hurricane) or a fast Cruiser (Stabber). There are no NPC ships to kill. The warp gate is 60km away from the warp-in point. The gate is configured to reject Capsules and Capitals. The toxic environment will damage your ship in consecutive toxic cloud waves. Each wave deals an equal amount of each type of raw damage with no resists applied. Damage amount increases with each successive wave. After the final giant toxic cloud wave there will be no more damage coming from the toxic environment. The toxic cloud waves will be reset after you have warped out. The waves take 4:00 min, if you warp back shortly after the final wave, they don't reset and you can fly to the gate unmolested. If you come back too fast they are still going and you can die. If you wait too long or if someone else warps in, the wave sequence may reset. The way to do this safely is to start a 4 minute timer as you start to warp, then warp out as soon as you land (about half the time a Shuttle can make it out), re-dock and get a new shuttle if needed, when the 4 minutes is up, warp in, fly to the gate. Fit an omni-tank with a minimum sustainable 200 ehp per damage type. Fit a Microwarpdrive (or afterburner) to quickly cover the distance to the warp gate to save time and if your tank does not meet the minimum requirement. If you're in a slow battleship fit a Micro Jump Drive, align to the gate and jump, you'll only have to fly about 15km this way. The mission is flagged completed once you have activated the warp gate and landed in the second room. Warning: Attempting to warp to the asteroid field in the second pocket using a bookmark will land you in the first room with the toxic cloud, resulting in a very quick death for any unprepared mining ship. Completed 2 of 3 without triggering second spawn by accident by blowing up "The Mining Corporation Headquarters". Depending on time it takes to blow it up most may be better off just triggering the second spawn and getting it over with. 3 of 3 is easily cleared in Ishtar with an AB. and a small cap battery. NOT RECOMMENDED in killing the station. station dropped a can of worthless junk. took ages to kill with 9 sentry drones. you're better off skipping the station and getting another mission based upon the amount of time you waste for what is often a crappy set of junk loot. The waves in part 3 restart when ever someone warps in not just when u warp out. Completed Part 2 in an assault Frigate (hawk) with T2 Afterburner, T2 Overdrive injector and T1 Interial stabilizer. Used a shuttle for the Recon 2 and a Drake for 3. The Drake was fitted with 2 x Invul. II and a DC II. The waves hit for 250-350 each and the final one hit for 750. On part 3, If you are really desperate to get at that Veldspar, why not fit out the classic Mining Battleship? You can jet can mine away, BM your cans when done, finish the mission, and pick the cans up in a hauler later. Ran this mission on 3/23/2009 after Apocrypha patch - when running part 2 of 3, killing the first spawn then killing the station now marks the mission complete - with no need to go to the second gate. As the second gate is 76KM away fromt he warp-in point, this is a Good Thing if you're flying a BS. Did 2/3 in a Fleet Tempest; 3/3 in a sacrilege. No problems whatsoever. I have found that if you do not trigger the first wave by aggroing the station you'll get scrambled as they spawn at the locked gate. If you do trigger the first wave, you won't get scrambled, only quadruple webbed. Did it in a NavyOmen, however the quadruple web was almost deadly, cannot recommend a cruisersized ship for this mission. I have never failed to get out of 2/3 easily in the same stabber I have set up for 3/3. I suggest: Open your journal, view your mission, minimize it. Turn on all your brackets and find the warpout you can most easily align with your gate approach. Turn on afterburner and head for your warpout. Get ready to click your warp-to-distance button. When you get near the gate, you'll notice the first spawn pop up. At that point, you can hit your warp button. Before it even finishes kicking in, you'll see the other spawn briefly and your mission complete will display. Destroyed the mining station in 2/3 (Serp) using drones while afk and got large faction ammo (pretty common) and Arbalest HML - for the 1st time. didn't have to turn on the 2nd LAR. the final big wave is barely noticable. Warning I just did this mission tonight after not getting it for a long time. Usually on 3 of 3 I just hop in my tristan and using my afterburner fly to the gate rather quickly. When I entered the mission I was in my pod! [ 2009.08.20 05:17:10 ] (combat) <color=0xffbb6600>Toxic Cloud Environment hits you, doing 482.0 damage. [ 2009.08.20 05:17:10 ] (combat) <color=0xffbb6600>Toxic Cloud Environment hits you, doing 374.0 damage. [ 2009.08.20 05:17:10 ] (combat) <color=0xffbb6600>Toxic Cloud Environment hits you, doing 171.7 damage. [ 2009.08.20 05:17:10 ] (combat) <color=0xffbb6600>Toxic Cloud Environment hits you, doing 300.0 damage. Notice how the damage is 4 times the normal amount. I went back in with a Megathron, grabbed my dropped loot and slow boated it to the gate, total damage taken was 16,204.7!!! Don't know if this is a fluke or they changed this mission. Beware. Can confirm that sometimes you get scrambled on 2 of 3. Blitz'ed in a shuttle and they got me :P.
3 of 3 is very easy in a Domi with omni-tank (2x LARII, 1x Thermic Hardener, 1x Kinetic Hardener, 1x Explosive Hardener, 1x EM Hardener and a DCUII). Only one repper is needed so you can fit a 100mn AB to speed it up. MrHellcat - the toxic cloud damage doesn't even show in my log. Not sure why, never has for me. Did part 2 in a Cheetah, fully cloaked the whole way through, minimal risk! Dps down the cruisers first to break the dps up on the inc. Cruise missile tower following that, and then bs. If your tank can't hang align on warp in and cruise out. This works only if you attack the station first to get 4 webs instead of scrams. Low skilled pilots and leave active drones out when you leave and when you warp back in they will have aggro buying you enough time to drop another ship if you are having trouble. Destroying the station is a terrible waste of time. Terrible loot and mission completion off of shooting it once and then destroying spawn 1. Just did both 1 and 2 in a shuttle np. Took some armor damage on 2, but warped away just fine. On 3 I did it in an passive shield ishtar with t2 fit with 1 ab, 1 em amp, rest shield ext. The damage couldn't break my tank, sat there for a while at the end just to test it. All in all this is great for standing grinding. I've done this twice in the last week. For Part 3, I used a Domi, with LAR II, N-Type Hards for Kin, Therm, and Exp, and one ANP II. Fit an OD II if you think it's necessary, but I use an AB to get to the gate. I pulse my repper as damage comes in, no need to even run it full out. Did part 2 in a slasher with some manuevre rigs on it. Started heading for the gate then clicked on a planet that was in the general direction I was heading so it was on my selected items tab. The moment everything appeard I hit the warp to button. Easy money. By "perfect omnidamage", I mean 25% EM, 25% Thermal, 25% Kinetic, and 25% Explosive. Total pre-resistance damage is 36,600 hitpoints if you stay for the final wave. As with Recon Level 2, the wave at 5 seconds doesn't always appear. My Dominix observed it (1 test to measure if it was safe to use a Drake), my Drake has never seen it (used for the resistance measurements; 5 tests). Unlike Recon Level 2, most of the waves are perfect omnidamage, and it's even less worthwhile to try to optimize against one kind of damage. Made it through within 9 waves. Completed 2 of 3 in cap stable Caldari Navy Raven. Shields never went below about 75%. I pull out my Drake and fit an afterburner for Recon 3 of 3. Piece of piss, shields never get below 80%, toxic cloud barely scratches it. I warped in with a Caracal (was too hard), so i warped out again, getting my Megathron. After ~ 5min i warped back in again. I approached the gate without beeing hit at any time. Neither the 20s Waves, nor the "big" waves are triggered. Can anybody confirm such an Experience? Completed both with a Drake, 65% average resists on it with Purger rigs. Hint for Part 3: Warp in, Bookmark Gate, Warp out (somewhere behind the Gate, if possible). Warping to your bookmark gets you back to the beacon. Warping to your bookmark @ 50km puts you very close to the acc gate. They must have changed this mission recently, as I used to run Part 3 in a fast shield tanked assault frigate, and I'd always get out with a little armor damage. I just lost a Jaguar fitted with a Med Shield Ext II, damage control, and anti-EM and anti-Kin rigs. I went back in with a Stabber fitted as the OP suggested with two Large Shield Extenders, AB, and 3 overdrive injectors in the lows, and got destroyed as I was trying to warp out and still 10 km from the gate. I don't remember this mission being so hard in the past. Beware! Final hit at 10km from the gate, barely made a dent in my armor. Didn't need the 2nd repper at all. 3/3 - finished in a deimos (eanm + em, 2 exp, one therm active hardeners). 12:38:42 Combat Toxic Cloud Environment hits you, doing 89.0 damage. 12:38:42 Combat Toxic Cloud Environment hits you, doing 83.9 damage. 12:38:42 Combat Toxic Cloud Environment hits you, doing 151.5 damage. 12:38:42 Combat Toxic Cloud Environment hits you, doing 121.4 damage. one medium repper, done in 6 cloud volleys. Done in Dominix with 4x Large Hardeners, 1 for each damage type. Never was below 90% of armor. For mission 2 if you don't have around 550+ DPS you are probably better off going to the gate. The mining station looks easy to blow up but it has huge structure. Confirming that warping in and then warping out and then warping in again will cause the toxic clouds to not hurt you at all. Completed Recon 2 in a Buzzard. Just cloak, fly to acceleration gate. Once within 10km, spawns come, but since you are cloked, no aggro. Dock back into station. This mission (part 2) was easy in an Armor tanked Mega (2 N-type Kin Hardners, 2 N-type Therm hadners). Watch your drones though; I lost 4 tech 2 hornets - the damage accumulated on drones fast. Level III very easy in a Mega with same fit as above plus an additional N-type Exp Hardener. Never went above 25% Armor damage (but I did have an LIF Fueled 1 Booster Rocket for extra speed). 3/3 Completed in -way- overtanked Raven. Made it to the warp out before final wave, was taking about 100-200 damage a wave. Hung around to see what final wave would hit for, and it hit for about 500 damage. Just did this in an overtanked Harbinger for part 3. T2 energised nano mem + hardeners X4 (em, therm, kin, explo). I stripped unnecessary mods just in case but it turned out to be very easy. Last pulse of damage took armour to 80% damage. During trip to gate I never went below 90% which Armour repairer (T2) dealt with easily. Run 1&2 in a shuttle, 3 was easily done in a Brutix BC. Never hit for more than 480 after resists, consider my ship's base armor is over 5k it was a very light hit, easily repaired dmg by turning on repair before next hit, I could have ran both reps the entire time but there was no need to. If anyone is wondering, you cant do recon 3 in a capsule. Don't know if this was a bug, but I tried first in a well tanked vexor, got through about 3 waves, then had to warp back out. Came back in my Drake, and didn't get hit once. Looks like the waves were stopped by warping out, in my case at least. I tried a shuttle for Recon (2 of 3), got mission complete then blown up before I could warp out; I came back in my pod (no great loss). For Recon (3 of 3), I used a megathon with a tech II microwarpdrive - cap was a bit tight but it worked out great, fast and I only had to turn on my armor repair at the very end as I slowly warped out from the gate. Trick for 2 of 3 in shuttle: align to a celestial before closing within 10km of the gate. Being pre-aligned, you warp instantly and they don't get a chance to lock you. Incarna patch - toxic gas cloud is no longer green. (2 of 3) I just zoomed in a Shuttle, hovering my finger over the Warp To of the station, and got out before anything locked on me. More free money. (3 of 3) Got in my Apoc with 1 active hardener of each type and a DCU II with repper, tanked the damage easily. All waves were done before I was even halfway done slow-boating over to the gate. More free money. Dunno if it's a bug or not, but they've removed the green cloud from Recon 3. Ran it for the first time in months today. If you blitz 2/3 with a frigate, you best approach the gate from an angle such that you will already be aligned when you trigger the gate spawn. Laziness killed my manticore. Just ran 3/3 in a Crow interceptor. 4,972m/s with MWD. First blast dropped shields to 50%. The 2nd blast hit as I was warping via the acceleration gate, so no damage done. Message > Someone has warped into the area, causing distruptions in the chemical balance of the toxic waste cloud. Explosions can be detected in the distance. Message > Waves of radiation, debris and hazardous gas blast into your ship. Your computer detects that these deadly currents are growing. You should probably make your way to the acceleration gate as quickly as possible. Message > Waves of radiation, debris and hazardous gas blast into your ship. Message > Waves of radiation, debris and hazardous gas blast into your ship. The dangerous currents have subsided ... for now. This acceleration gate is not configured to handle your Capsule. Entering this area again in my BS the damaging cloud was reset and started doing damage again. Still in a Maelstrom with medium shield skills and a 100 MN MWD this can be done without scratching the armor. Damage log:012.06.28 03:34:27 ] (combat) <color=0xffbb6600>Toxic Cloud Environment hits you, doing 120.0 damage. [ 2012.06.28 03:34:27 ] (combat) <color=0xffbb6600>Toxic Cloud Environment hits you, doing 86.4 damage. [ 2012.06.28 03:34:27 ] (combat) <color=0xffbb6600>Toxic Cloud Environment hits you, doing 115.2 damage. [ 2012.06.28 03:34:27 ] (combat) <color=0xffbb6600>Toxic Cloud Environment hits you, doing 240.0 damage. [ 2012.06.28 03:34:32 ] (combat) <color=0xffbb6600>Toxic Cloud Environment hits you, doing 132.0 damage. [ 2012.06.28 03:34:32 ] (combat) <color=0xffbb6600>Toxic Cloud Environment hits you, doing 211.2 damage. [ 2012.06.28 03:34:32 ] (combat) <color=0xffbb6600>Toxic Cloud Environment hits you, doing 158.4 damage. [ 2012.06.28 03:34:32 ] (combat) <color=0xffbb6600>Toxic Cloud Environment hits you, doing 264.0 damage. This mission (part 2) nets about 5M worth of drops (including 1000 faction ammo from killing the station) and 1.375.000 in bounties. Here's a Stabber fit that I cobbled together from random trash I had in my hangar. It usually completes part 3 without denting the armor. I did 3rd part in a CNR with nanofibers 100mn mwd and all resists and invus t2 in the middle slots. Lost only 20% of the shield. An MJD is perfect for Recon 2. It dropped my right on the gate. It's not half bad for for Recon 3, either, although you will need to backtrack a bit. My base shield/armor/hull hitpoints were 548/2137/1273. My base EM/Th/Kin/Exp resistances (without the field on) were 58/60/85/50 shield and 50/68/84/40 armor. Switched the containment field on as I was arriving at the warp-in point. The initial wave at 0s took out my shield, the waves at 5s and 25s reduced my armor to 26% as I was MWDing towards the acceleration gate. Warped out long before the wave at 45s could hit (would still survive it, though). "Unconfirmed: Toxic cloud will be disabled upon losing your ship and will not re-enable. (Confirmed by Dai Verdigris 14.8.2012. Lost a Frigate, returned with Battleship. No clouds)"
Lost a Rookie frig, came back in a MWD fitted frig. No cloud, no damage. Toxic Cloud is time based and will re-spawn if you wait too long to return to the pocket. Trick under "How it works" worked for me first time. Started timer as soon as I clicked "Warp to location." Warped back as soon as I landed. Waited.... Clicked "Warp to location" exactly 4 min later. Cruised to gate... no damage at all. Not sure when the waves would restart, but I was flying a 2800 m/s frigate, so I wasn't there all that long. Recon. 2/3 Easy.. MWD recommended for faster travel. This custom fit worked easily enough for L4 mission 3. No guns. Turn on actives and run but delay armor rep until after the 1st wave is over. The 2nd time I did this I had Trimarks instead of the Nano Pumps - made it easily enough but cap ran out just as I got to the gate. Paladin w/ MWD. Reached gate before my shields were down. The 4 minute trick worked for me twice. 1) Take shuttle named 神風 (Kamikaze) outside the station. 2) Set the station you just left as "Destination"
3) Click "Warp to location" and start your stopwatch/timer. 6) wait for the timer to hit 4 min. and click "Warp to location"
9) Return to station and collect payment. l 24 km away ! Maybe do it in an Orca next time !